It is presently the only Canadian gamelan to perform on a five-tone gong kebyar ensemble. A gamelan is composed of many intruments, including gongs, metallophones, drums and cymbals, and sometimes suling (flute) and rebab (an upright two-stringed indonesian fiddle) which essentially play ornaments around the underlying melody. Giri Kedaton's instruments, donated to Canada by the Indonesian Government after the 1986 World Fair held in Vancouver, B.C., are of spectacular beauty. L'Université de Montréal currently owns the instruments and is Giri Kedaton's official home since 2002. 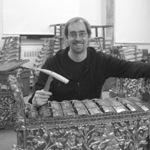 Founded in 1994 by Sylvain Mathieu, who assumed the group's artistic direction for 12 years, Giri Kedaton benefited from the teachings of the greatest Balinese masters who were invited by l'Université de Montréal over the years to transmit both modern and ancient Balinese tradition of this centuries old musical culture to their new Canadian disciples. Éric Vandal currently leads the band, made of about 20 young Quebec musicians and dancers Annick Brault and Ni Komang Swijani (who have been sharing her passion for Balinese dancing since the early days of the ensemble). From the very beginning, the band has revealed the exotic sounds of gamelan to a wide audience and on many stages, performing for Radio-Canada's radio and television productions during the 1990s. Worthy of mention is also a spectacular appearance in Festival d'ondes Martenot (1998), where the ensemble interpreted Canadian composer José Evangelista's composition for gamelan and ondes Martenot. Fall 1999 saw the group's first tour, a series of performances in Maisons de la Culture Montréal's stages. The next year, the band played for the 50th anniversary of l'Université de Montréal's Music Faculty in a concert that was broadcasted on national radio. Since 2002, Giri Kedaton has played in a multitude of venues in Quebec, organized benefits for humanitarian causes and collaborated on many of Indonesia's Canadian Embassy events, including the 50th anniversary of the relations between the two countries, presented in Toronto's DuMaurier Theatre and Gatineau's Museum of Civilizations. Recently and with great success, the ensemble unveiled its latest production, 'Projet Bali X', performing in Montréal's Théatre Plaza (2007) and Maison de la Culture Ahuntsic (2008). 'Projet Bali X' is made exclusively of the band's original material and mixes Balinese tradition and urban sounds in a very unique fashion. The indeniable success of this production led the group to the upcoming release of their first album, which will be launched during 2009.